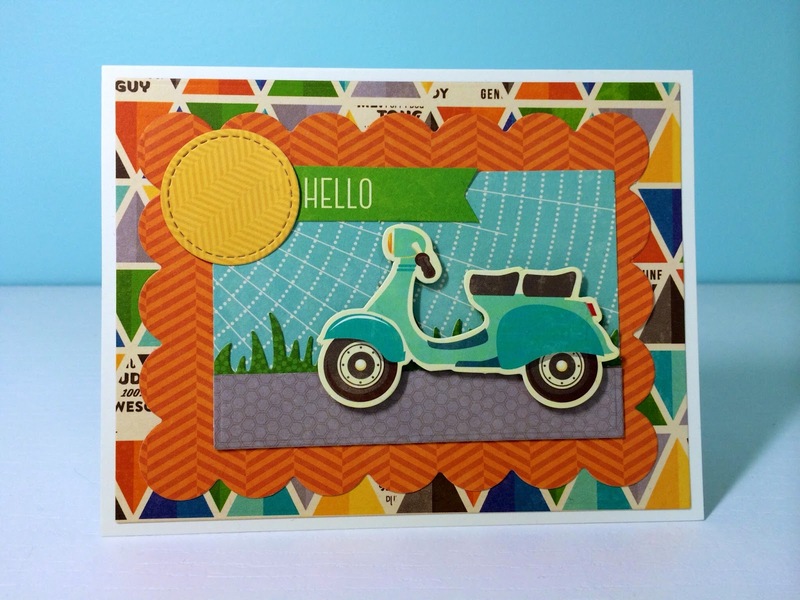 Hello, Stampin' and Scrappin' Addicts! Ready to get your fix on the Hampton Art blog today? When my mom retired a couple of months ago, they gave her a party, and I thought it would be nice to make a card that could be used for an all-office invitation to a retirement bash. You know, something cute and fun to stick on the bulletin board for all to see. These lively geezers from the His and Her Flying High set are the perfect answer, I think! Cut and adhere patterned paper mat. Cut and stamp image panel. Die cut cloud and hold in place on stamped panel while gently applying blue ink. Repeat until background is filled in with "clouds." 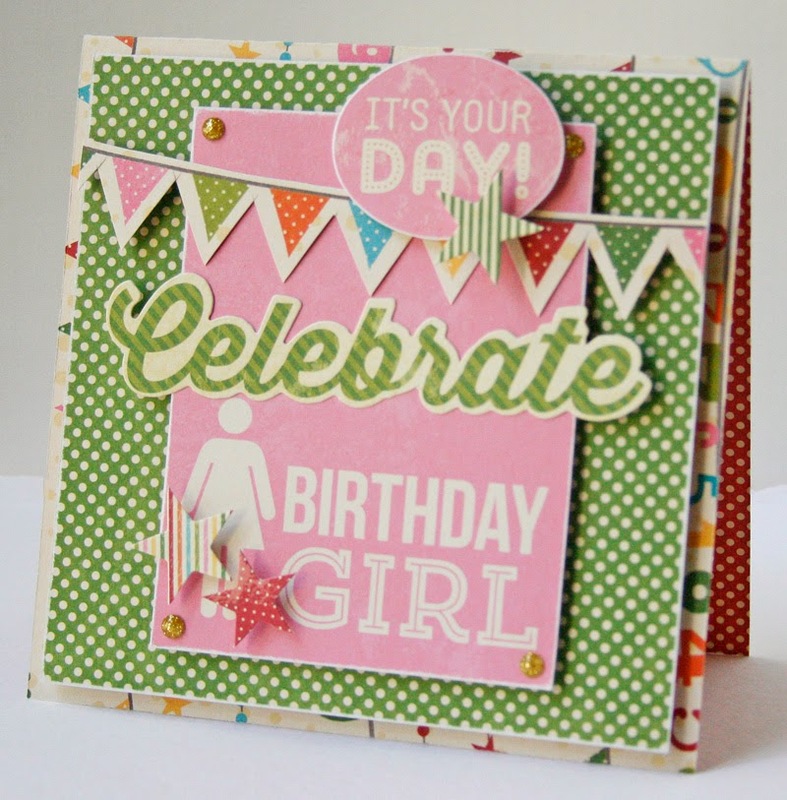 Adhere stamped panel and sentiment die cut shape to card. 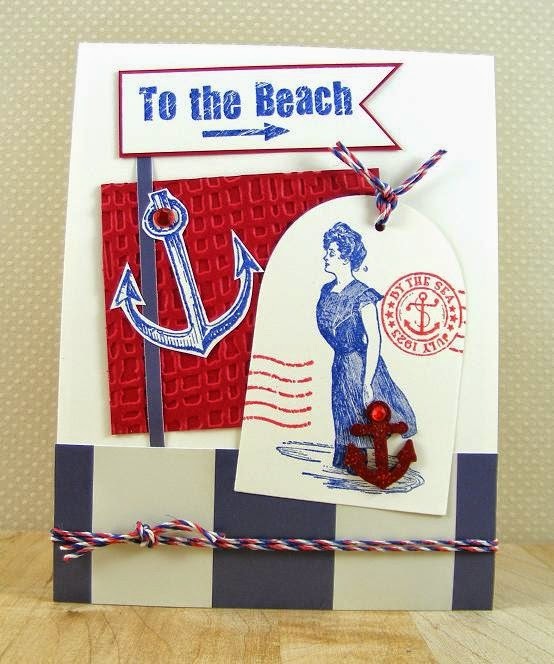 Free-hand or use stitching template to draw a border around the stamped panel and the sentiment die cut shape. Create a bank of clouds as a background by die cutting a cloud to use as a mask. Hold the cloud die cut in place (no glue for this, please) with one hand and lightly apply ink with a foam ink applicator tool. Vary your pressure and reposition the cloud die cut often. Although you can mask your stamped image, you don't have to. I didn't, and, as you can see, I was able to position my cloud die cut in such a way as to avoid inking over my stamped image in any significant way. If you want to create a single cloud or two, use the negative of the cloud die cut as a stencil. Well it is back to school time, or in my house off to school for the first time! I thought it would be fun to create some sweet little lunchbox notes to include in my son’s lunchbox someday soon. So I grabbed some fabulous Canvas Corp. papers, stamps and mini bags and got to work. So do you think your little students would like to find one of these in their lunch box? You decide. I can’t wait to give a gift to my best friend, because this tag is going to be hanging off of it for sure. 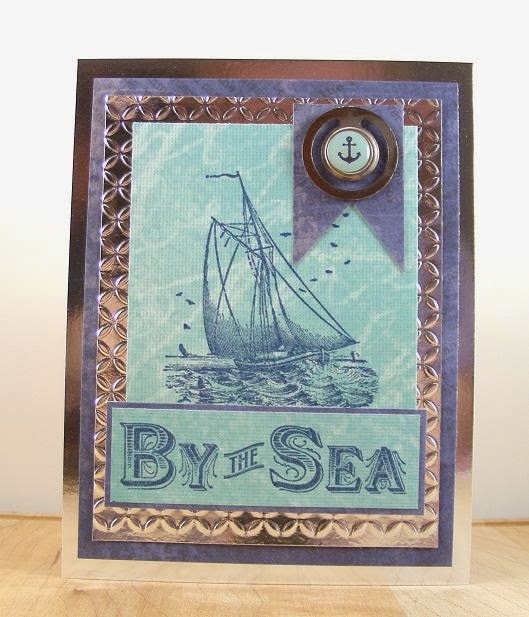 I love the sentiment stamp ( LOL, laugh out loud stamp SC0622). 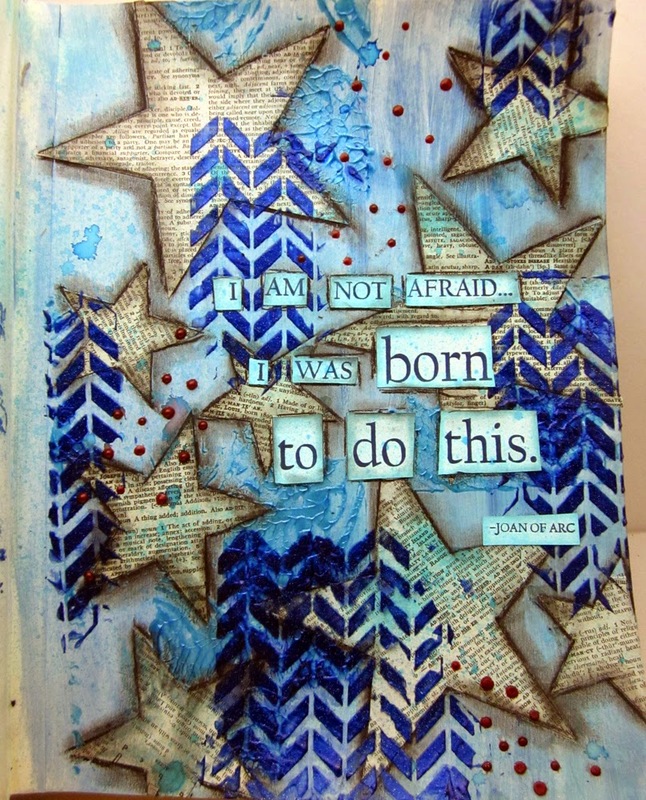 I stamped it with Versa Mark ink and then embossed it with aqua embossing powder. I cut the sentiment out and then colored in the border edge with colored pencil just to give the edge some definition and pop. For the base tag I used the Vintologie Adhering Stencil and cover the entire stencil with versa mark and then clear embossing powder. Once it was heat set, I used a blending tool and added in various shade of ink. The flourishes from the stencil remained cream colored while the rest of the tag got blended color…beautiful. I added some ribbon and flowers to the tag to finish it all off. Be sure to check out the LOL Stamps, there are some of the cutest phrases and stamp sets, you’ll just have to have. 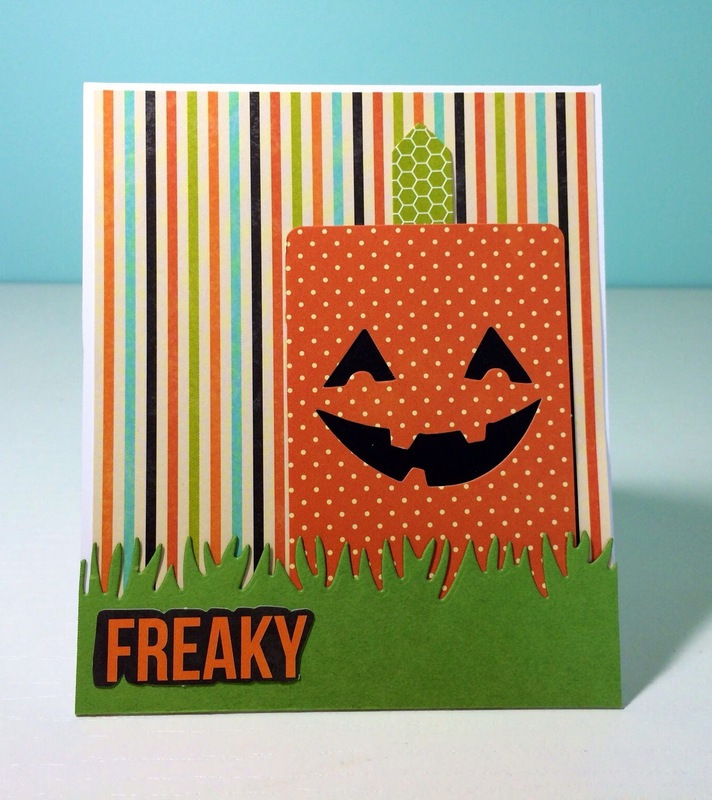 Howdy, cardmakers and scrappers! 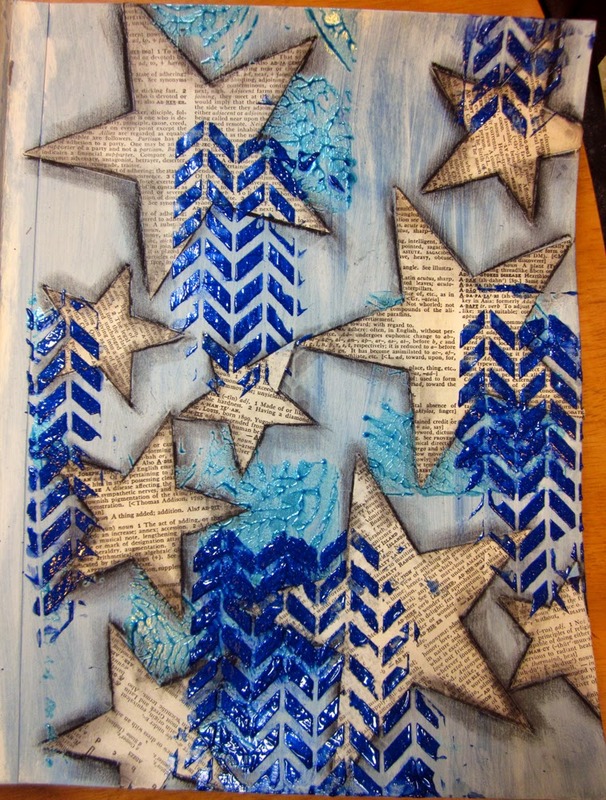 I'm happy to welcome you back to the Hampton Art blog for some more product play and inspiration! 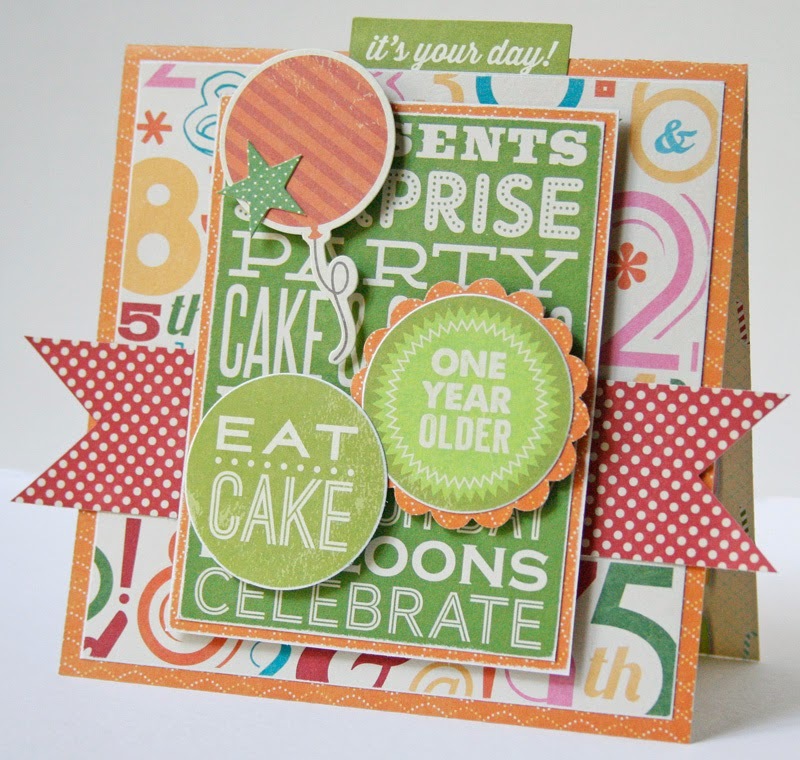 Today's card features Birthday Bisque products from Jillibean Soup and is a straight up party invitation. This is a really fun and versatile collection, so I know you'll enjoy exploring all of its options. Cut sentiment panel from PP #1 and adhere to mat of PP #2, then adhere to card on an angle. Trim overhang of sentiment panel from sides of card. Adhere sentiment die cut shape and sticker. 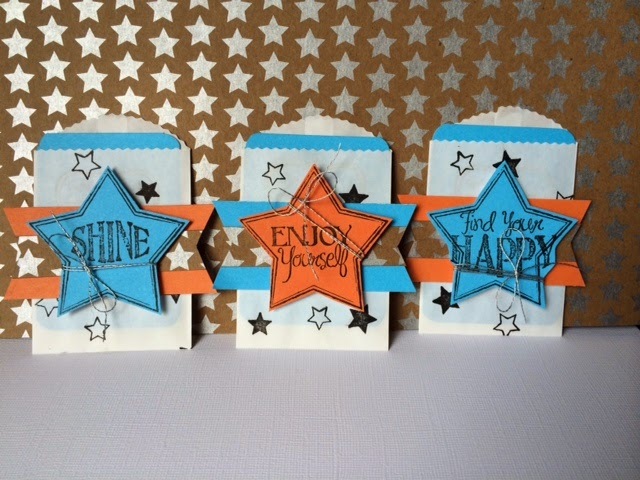 Adhere balloon die cut shapes with foam dimensional adhesive. Here is a card featuring some brand new Jillibean Soup Soup Staples 3 papers and embellishments with a touch of new Mix the Media Ephemera Pack. 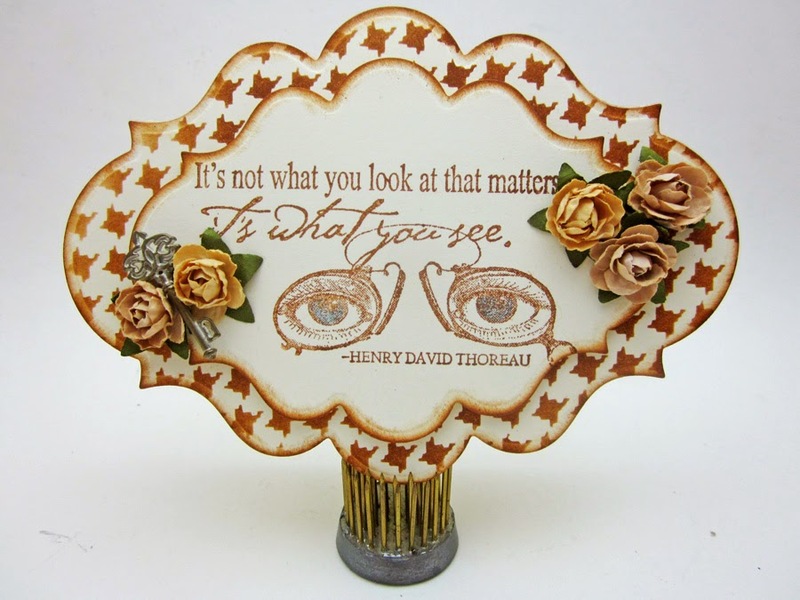 Oh and I just can’t get enough of the new Doilies and Woodgrain stamp and stencil set from Jillibean Soup it is so versatile I find myself coming back to it over and over again. 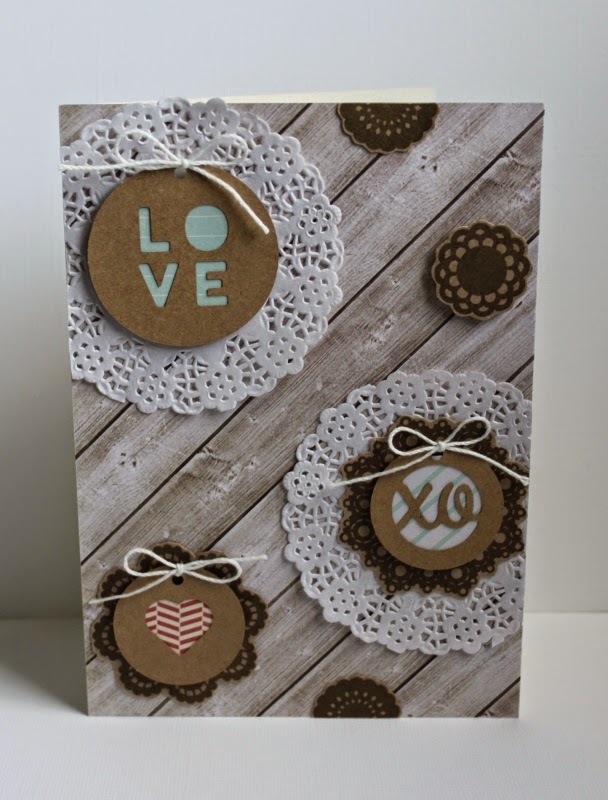 I could not resist the lovely new circle kraft tags in a love you theme, I used Love spelled out, xo, and the cut out heart. Using the cotton twine included in the pack I added the three tag bows. 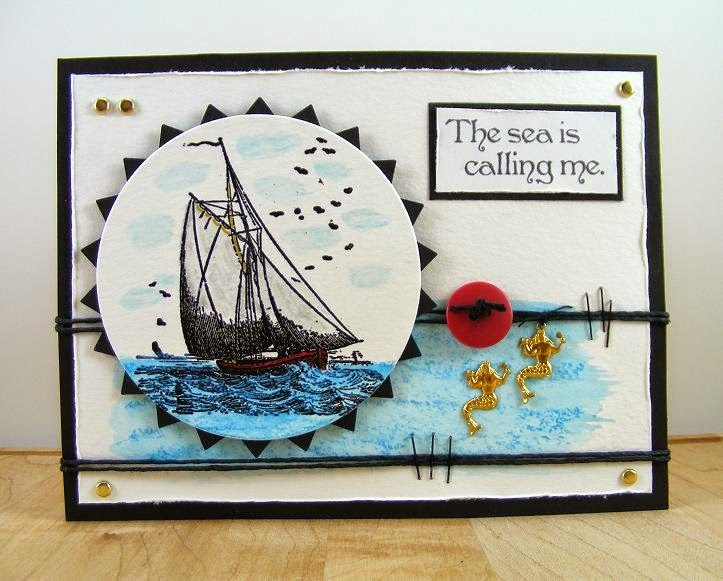 I made the new Soup Staple 3 paper my card base and added some white paper doilies from my mix the media ephemera pack. 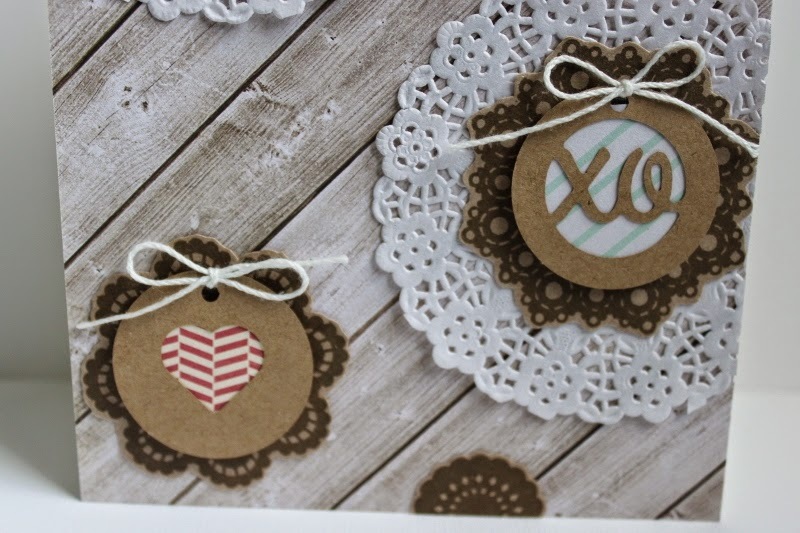 Using the doilies from the set I stamped them onto the kraft cardstock using brown ink. Then I started layering, being sure to add backer papers to the kraft tags for extra emphasis. A subtle and sweet card was the end result, perfect for lots of different occasions. Really loving these new products! Morning! 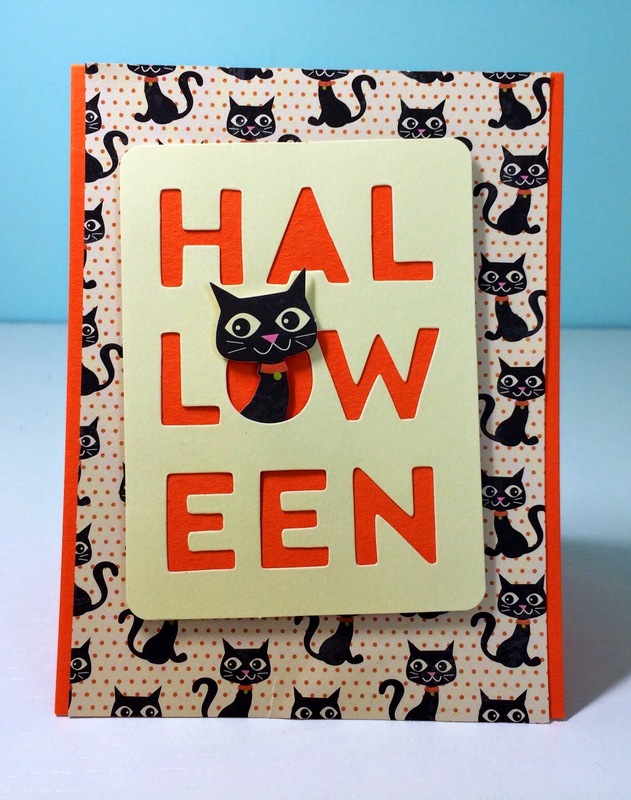 I’ve got a couple Halloween cards to share with you. I was so excited to see Jillibean Soup coming out with new Halloween products! 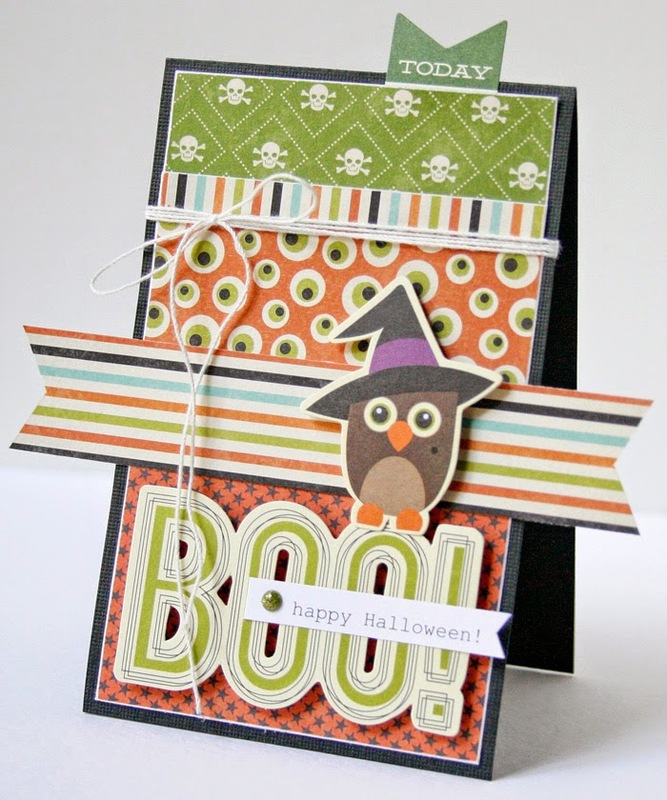 The “Owloween Stew” and “Witches Brew” lines are very fun and versatile! I made both of these cards using a combination of the 2 lines with a few KI Memories glitter dots thrown in for fun. And I used lots of foam adhesive to give them some good dimension. Thanks for looking and thanks for stopping by the blog today! Welcome back to the Hampton Art blog - I'm so glad to see you! 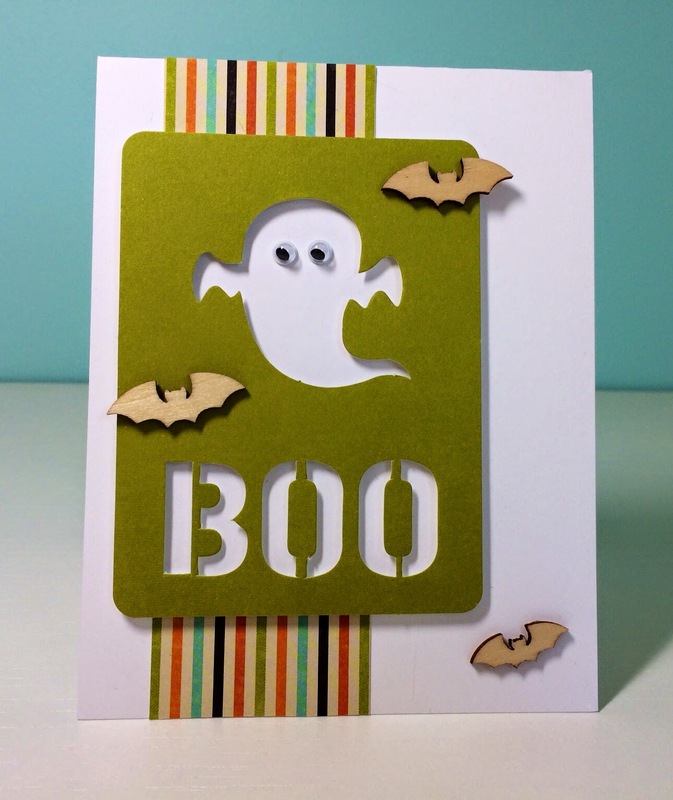 Today's card features Cool As a Cucumber Soup products from Jillibean Soup. Although this is, technically, a "boy-themed" collection, it's versatile enough to use on just about anything. I hope you get some inspiration from this design and enjoy playing with these products (I know I did)! Make card base for a 4.25” x 4.75” card. Cover base by adhering patterned paper #1 to fit. Cut PP #2 panel; wrap and tie ribbon before adhering to card with foam dimensional adhesive. 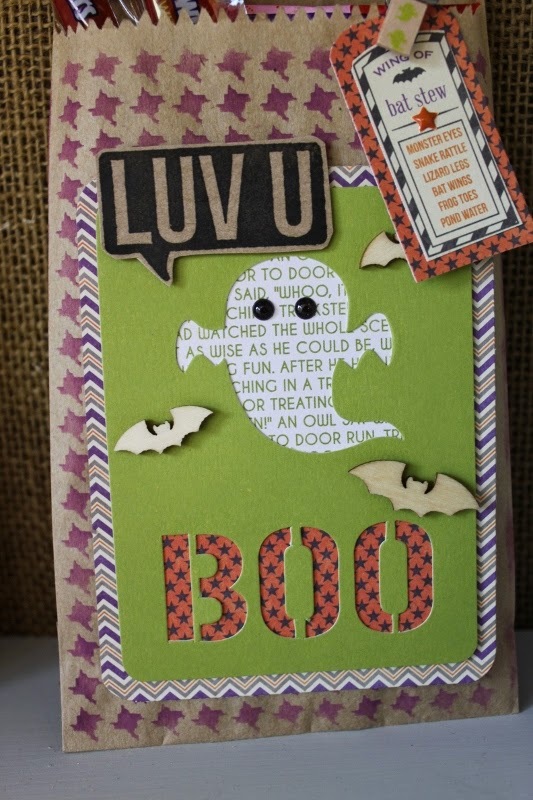 Cut "Loveable" journaling card from PP#3 and adhere alphabet stickers. 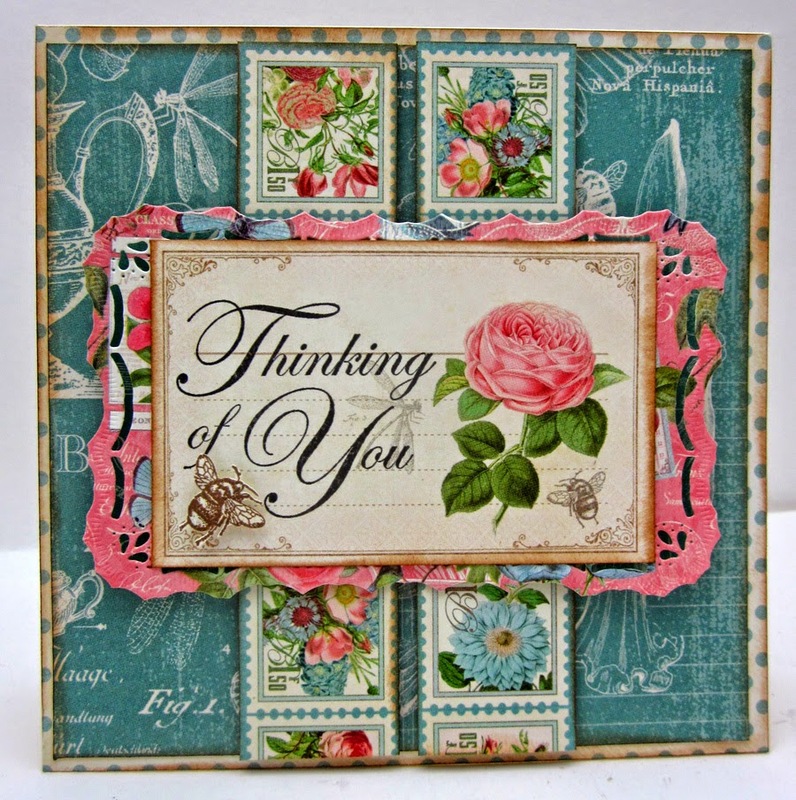 Cut accompanying mat, layer with "Lovable" journaling card, and adhere to card with foam dimensional adhesive. Die cut feathers and adhere. Thread buttons with twine and adhere along with gems to card. 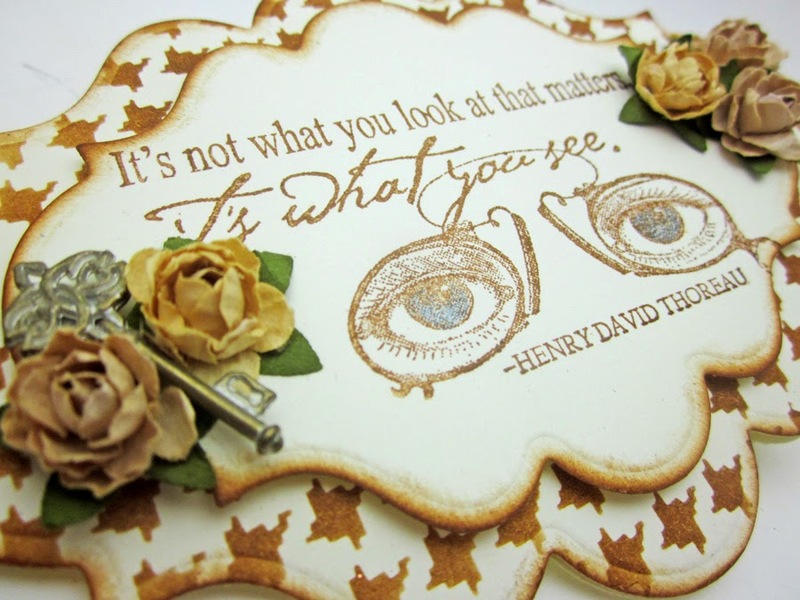 I love this quirky little card, it’s shape, the stencil and the eyeglasses with eyes stamp…super cute. I created the base card using a Spellbinder die. I folded over a sheet of card stock and then ran the die over with an edge of sticking out, so it cut the whole image but left a bit connected at the top so it will open as a fancy shaped card. I then used one of the self sticking templates from Hampton Art that I love ( SC0645 ). The way the stencil adheres to the paper makes sure that no ink gets under the edges and it gives a nice crisp finish. Next I stamped the image on another sheet of card stock and then cut it out with the smaller Spellbinders. (TIP: Don’t forget to ink your edges, that gives a finished look to all your projects.) I colored in the eyes with colored pencils and finished everything off with some embellishments. 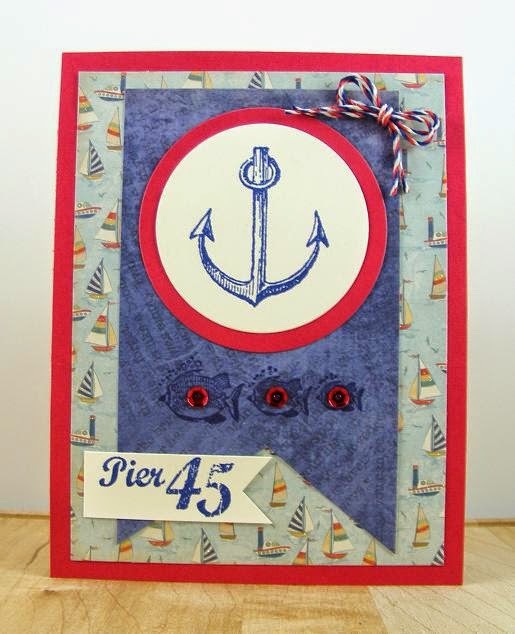 The stamp is one of our wooden block stamps from Graphic 45 (PS0767). Please be sure to stop back in tomorrow with another creative inspiration from our design team. “Birthday Bisque” line from Jillibean Soup. I went a 5”x5” square shape for both of these and I used lots of foam adhesive to give the cards some nice dimension. Thanks for looking and thanks for stopping by the blog today! 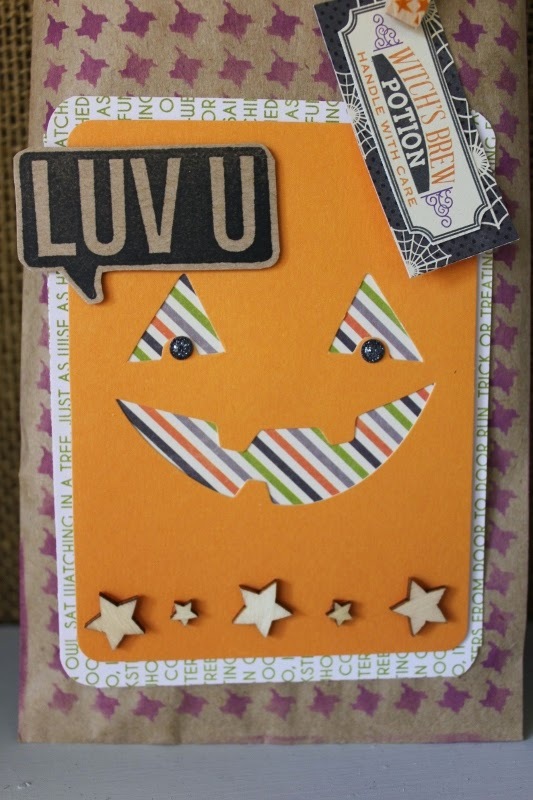 It’s Deborah here, and the card I made for today uses Halloween treats from Jillibean Soup and stamps from Graphic 45 - all licensed through Hampton Art! Make black card base for a 4.25” x 5.5” card. Cut a 4" x 5.25" panel of purple cardstock and adhere to card base. 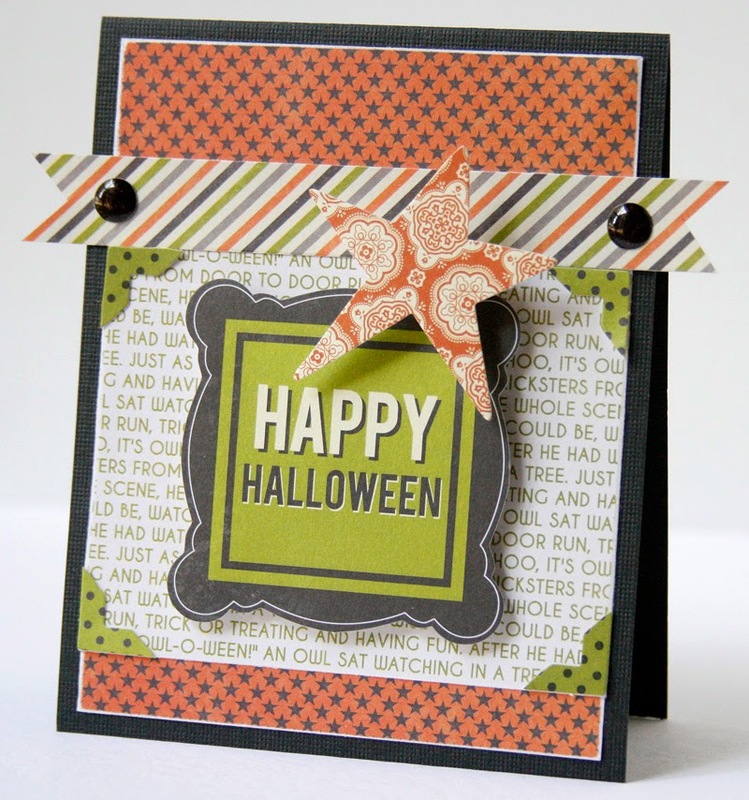 Cut a .25"" x 5.25" stip of patterned paper from Owloween Stew and adhere. 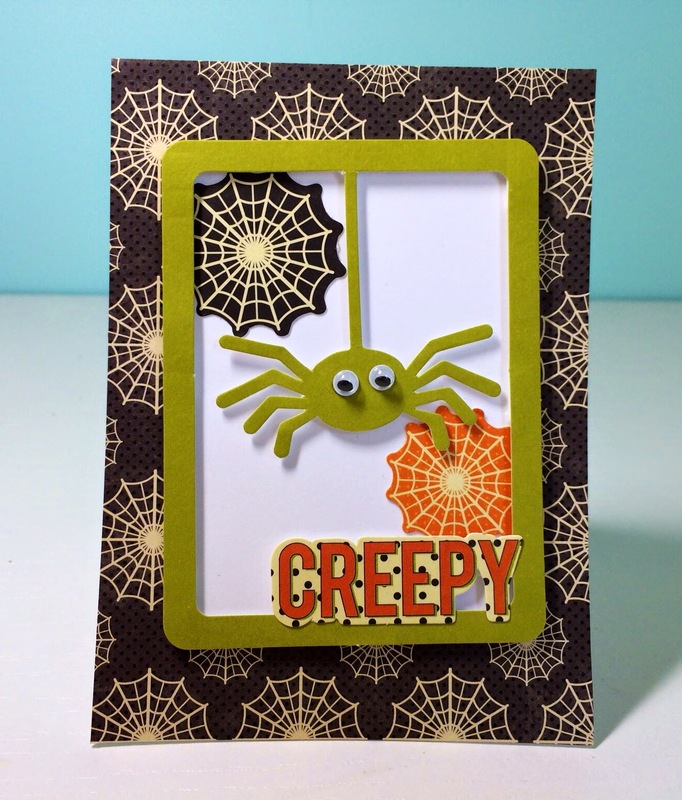 Ink spider web with embossing ink and stamp in upper right corner; apply Platinum EP and heat set. 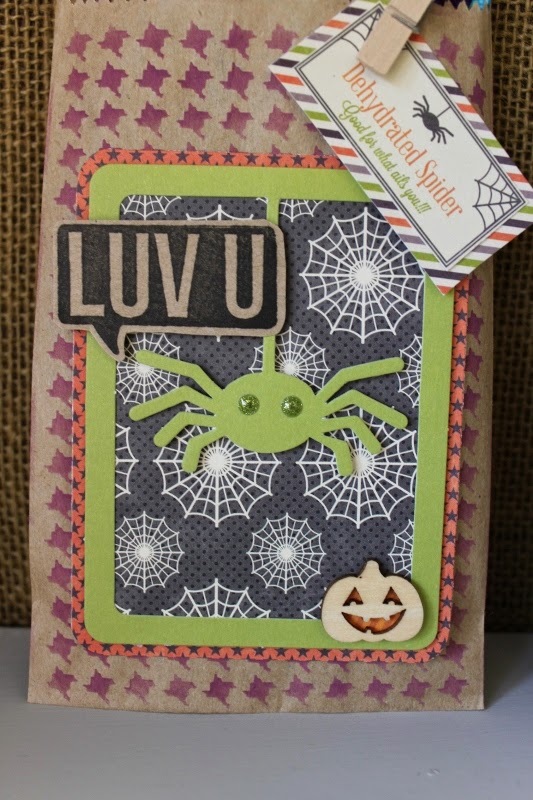 Ink spider with embossing ink and stamp; apply Black EP and heat set. Ink wood veneer phrase with embossing ink; apply Platinum EP and heat set. Apply more EP and heat set until you're satisfied with the coverage. 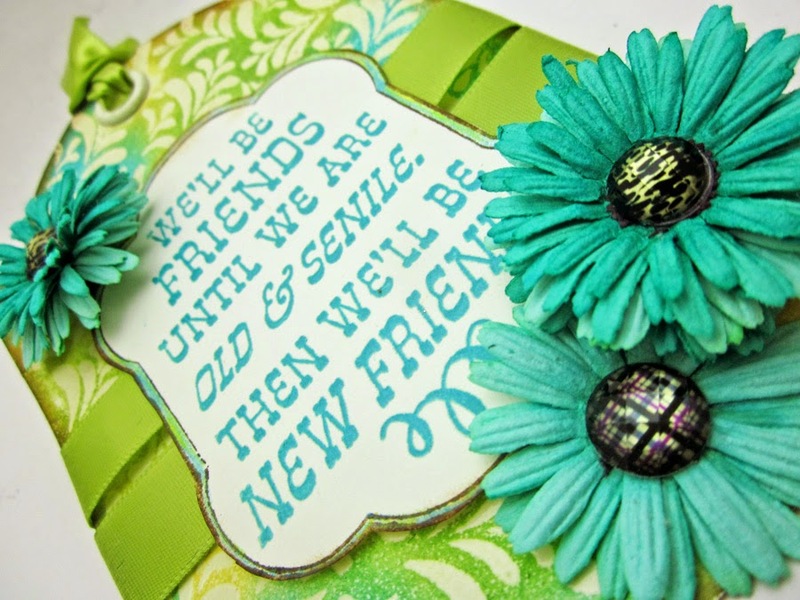 Today I have a fun patterned paper card to share using the new Cool As A Cucumber line from Jillibean soup and Hampton Art! I usually use patterned paper sparingly, but I decided to go all out on this card. 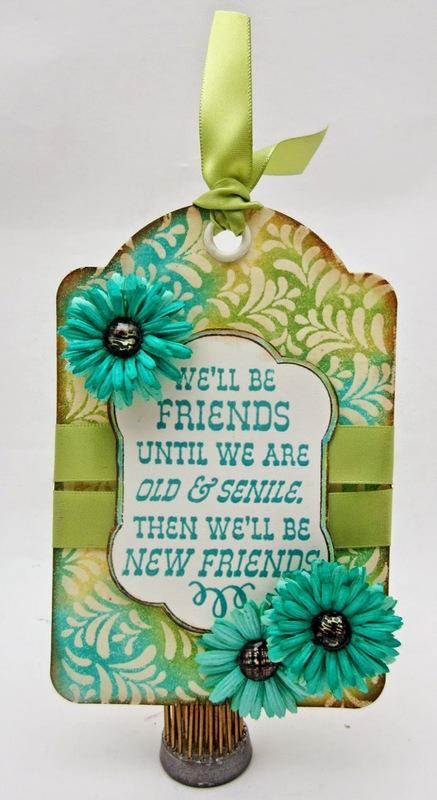 Today I have a simple card to share using the new Cool As A Cucumber line from Jillibean soup and Hampton Art! I think I'll give this card to my sweet husband. 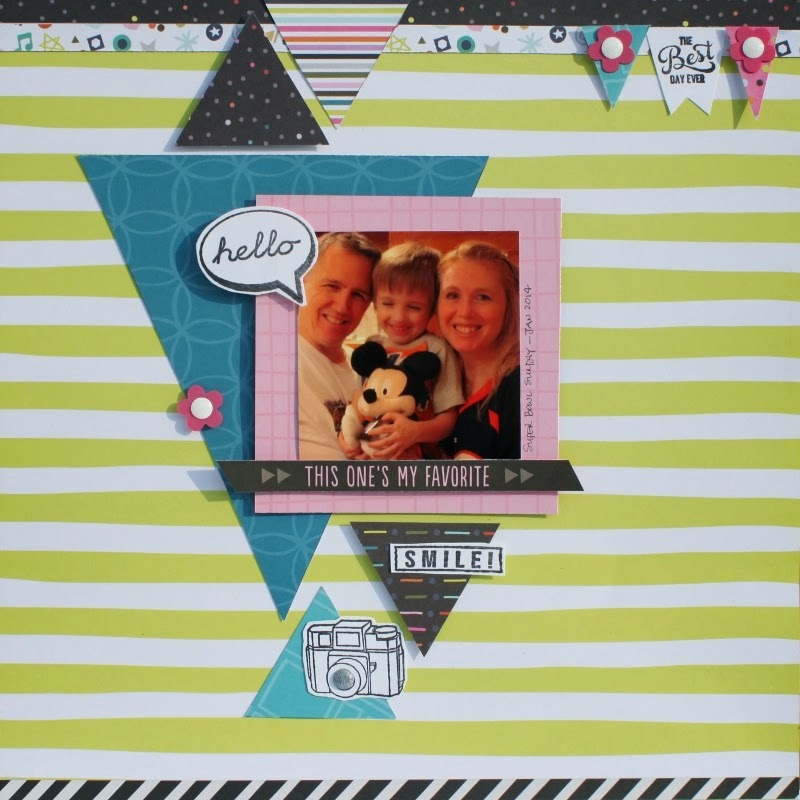 This playful every day layout uses very trendy triangles and the KI Memories Playlist collection partnered with a Vintologie stamp and stencil set. I just realized that every project I created for Hampton Art this month utilized a stamp and stencil set, I just love them! 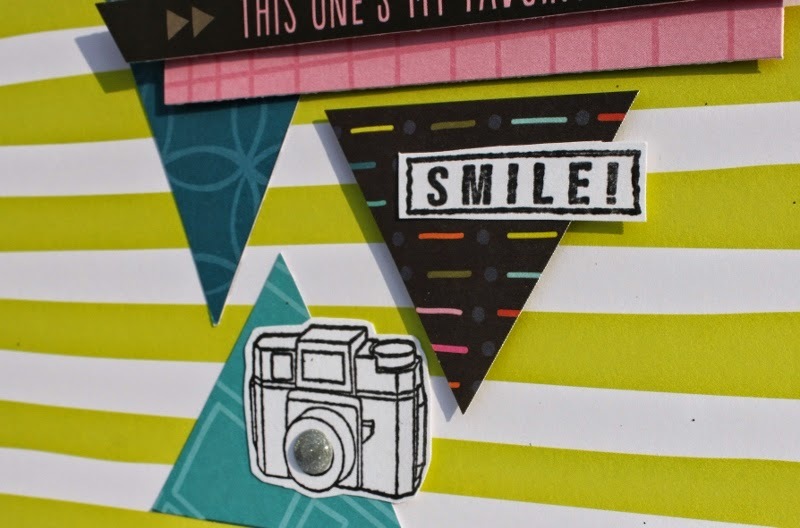 For this layout I only used the stamps but the stencil with this set is a super fun chevron. This layout begins with striped background and then two skinny border strips on top and one on bottom. Then I stamped the Hello, smile, Best Day Ever and camera images onto white cardstock in black ink. Those were set aside to dry and then four triangles of the same size were added cut from four complementing patterns of the KI Memories Playlist collection. Then one large triangle was cut out of the blue pattern. Next I cut the pink photo mat and added the family photo. 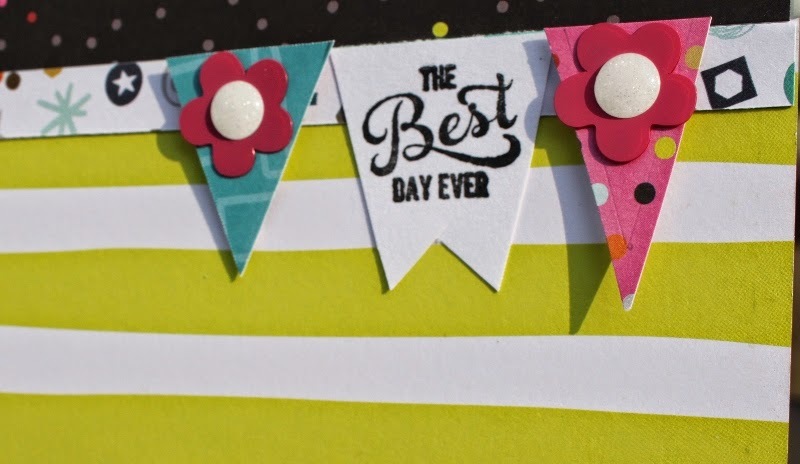 The little banner in the top right was constructed using two more triangles and fussy cutting the “best day ever” stamped piece into a pennant shape. 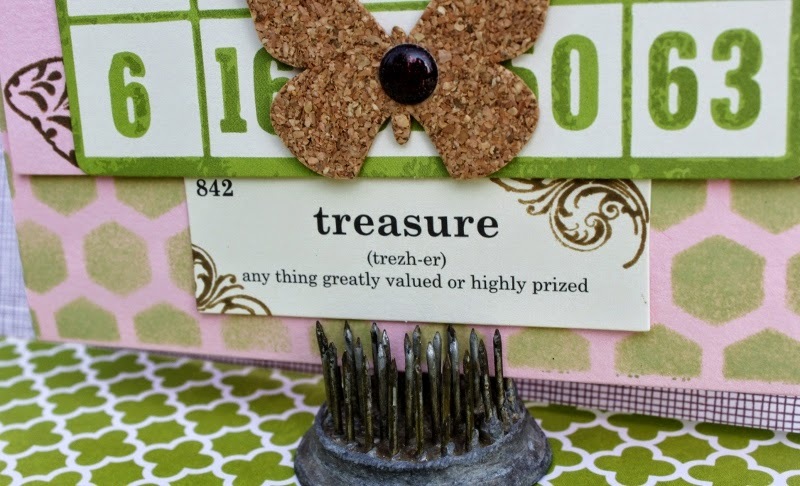 The other stamped pieces were fussy cut out and added to the page with adhesive or pop up dots as shown. The triangles were placed and the photo mat layered on. Some embellishments were added, the KI Memories Confetti flowers with white and silver glitter dots. This photo was taken on Super Bowl Sunday of this year and my family was so excited to have our team in championship game. The game didn’t go quite how we hoped, but it was still lots of fun. 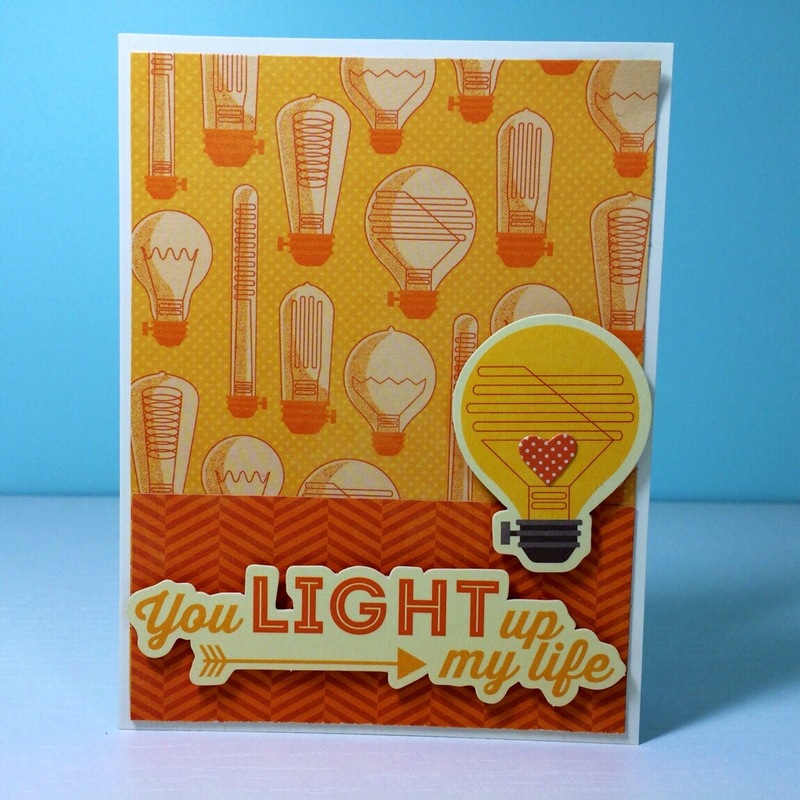 I had to use some of my favorite items from a brand new Jillibean Soup product for this card. The Mix the Media items from the Ephemera Pack in green paired up so nicely with the Vintologie Stamp & Stencil set. Then I selected one of my favorite color combos just for fun, pink and green. 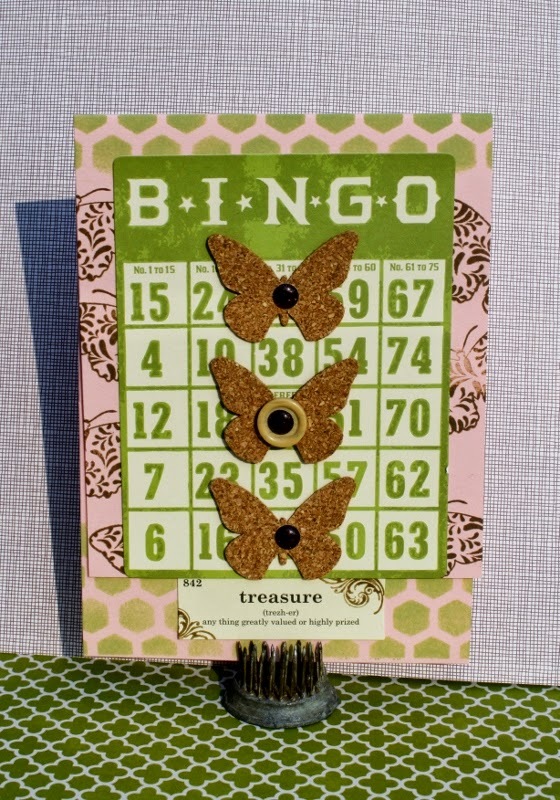 Last I added KI Memories glitter dots in brown and a wood button from the ephemera pack to finish the butterflies. 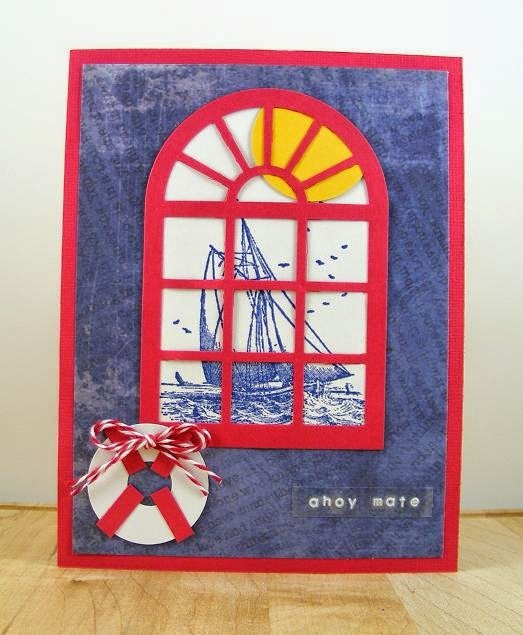 That was all it took, a whimsical everyday card complete with stamping and stenciling. 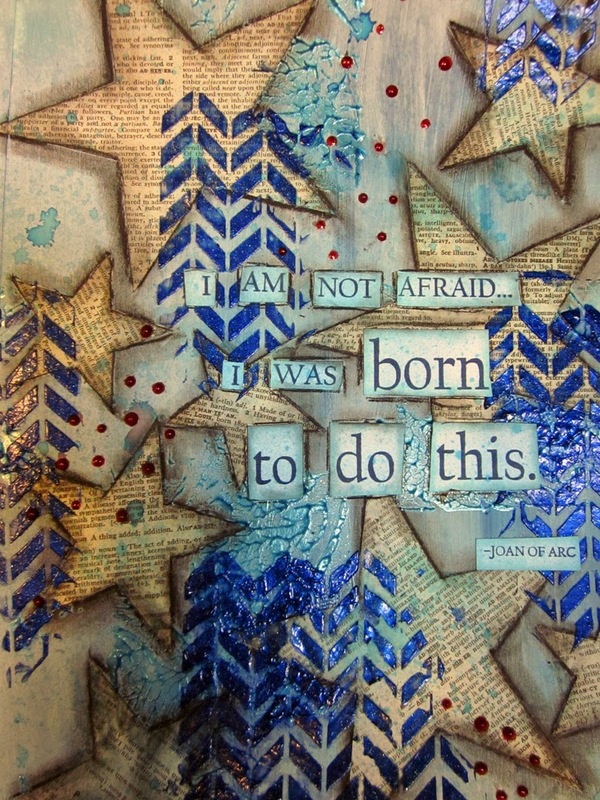 I have a beautiful art journal - well, the outside is gorgeous. But I realized, I had only completed a couple of pages on the inside - so I decided it was time to do something about that. And today, I'll share my first efforts with you. 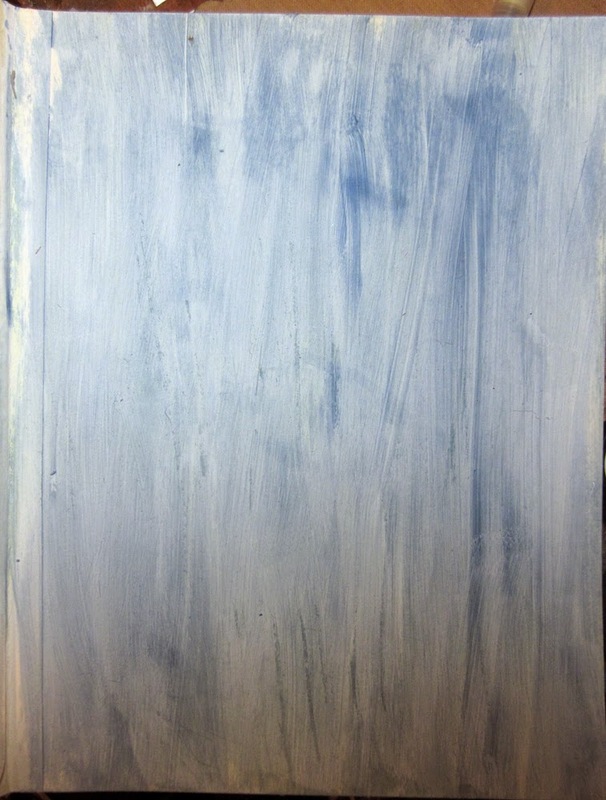 I primed my page with gesso. After it was dry, I lightly sprayed it with water, and used an old credit card to spread out some blue paint. 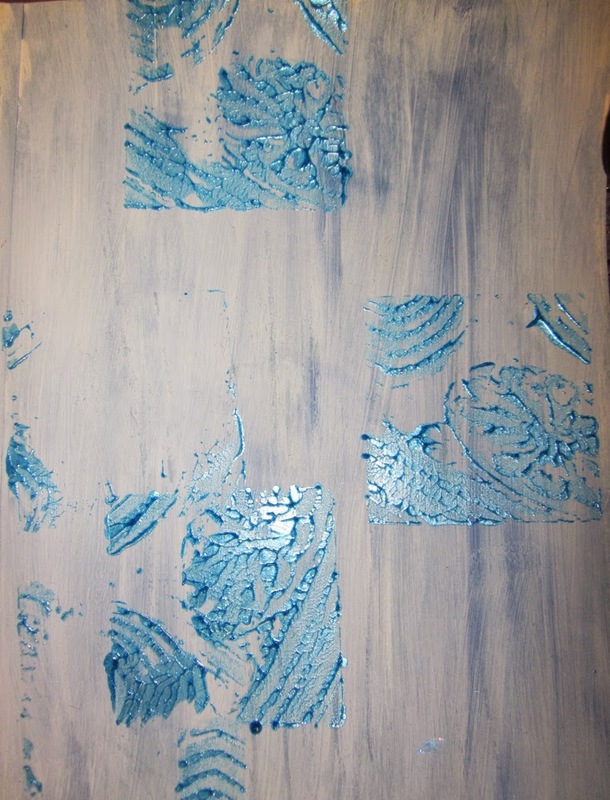 I painted a darker blue paint on Hampton Art's Fancy Facade (PS0817) and stamped it to add texture. 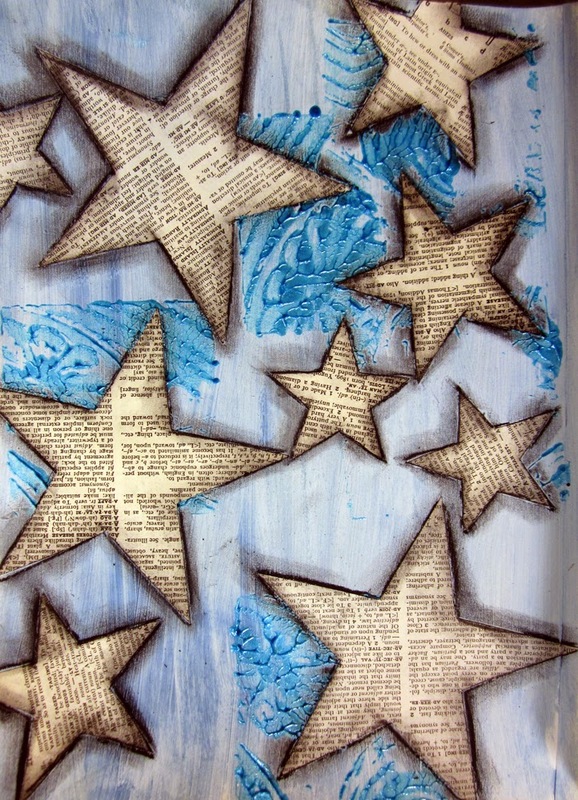 I cut stars from dictionary pages and glued them to the page and then traced around them with a charcoal pencil. 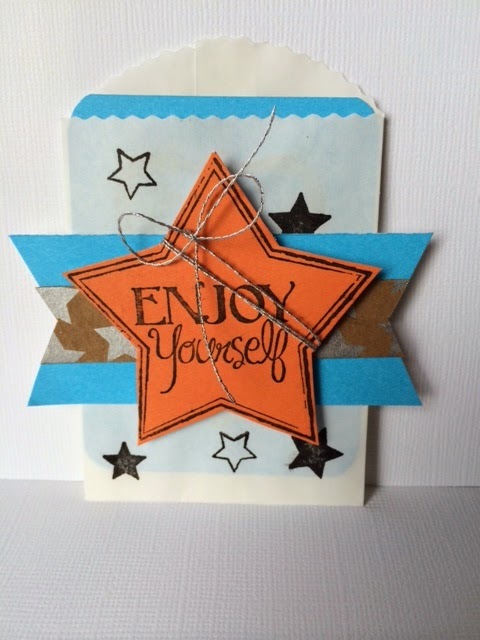 Next, I used the Hampton Art chevron mask from Mod Greetings (SC0641) and the Honolulu Blue Sorbet. I love this glossy, sparkly layer. I stamped the sentiment, but cut the words apart and inked them and glued to the page. Finally, I misted over the page with the Colorations - Waimea Bay. For a bit of contrast, I added dots of the Dimensional Crystal in Red Corvette. I recently had a couple of gifts to give friends but I ran into the problem of having nothing to wrap them in. Scrapbooking supplies to the rescue! I did have these small cute paper bags I had picked up at Hobby Lobby a little while ago and decided to use some KI Memories patterned paper and Jillibean Soup embellishments to decorate them. Perfect! 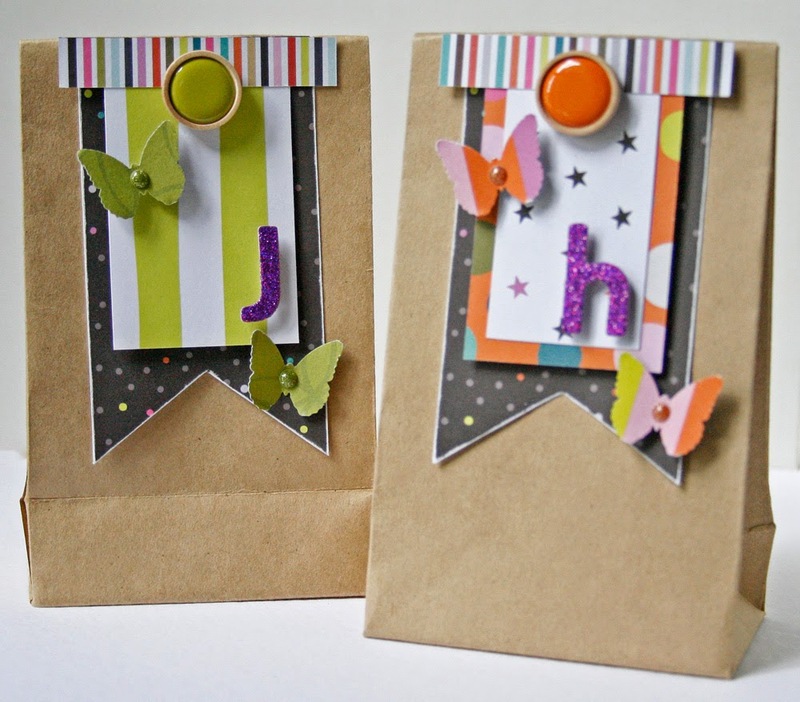 The “Playlist” patterned papers helped add some fun color the bags. I punched some butterflies and added a glitter dot to the center of each one. Then I finished off each bag with a button and a glitter alpha. Easy! And cheaper than most gift bags! I’m a huge bee lover…if there is stamp set, paper collection anything that has bees on it, I have to have it. So of course I love the Botanical Tea Stamp set as it has the most awesome bumble bee stamp and I used it on my card for today. I used the Botanical Tea coordinating paper collection and started off with a 6 x 6 base with inked edges. Next I cut a 5 ¾ x 5 ¾ designer paper squared, inked and attached to the base for layering. The postage stamped border were cut from the paper and then attached with foam tape. I cut a die cut square out and lined up in the middle of the card. 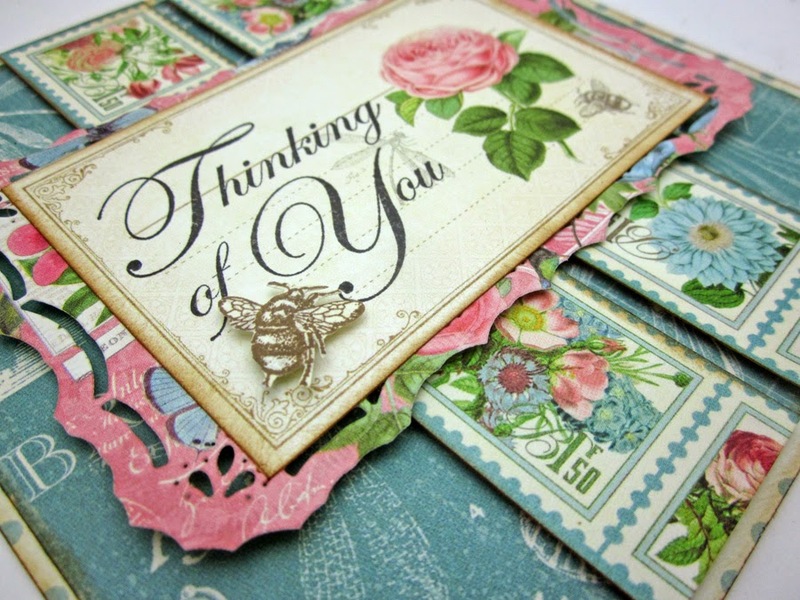 Then I cut out the postcard middle of the paper and stamped my Thinking of You sentiment in the middle. Next I stamped the much loved bumble bee on cream colored card stock and fussy cut out. I had to attach the bee with foam tape because I wanted him to look like he had just landed. I inked the edges of the little postcard and then glued down on the die cut to finished it all off. I don’t know about you but I love Halloween! 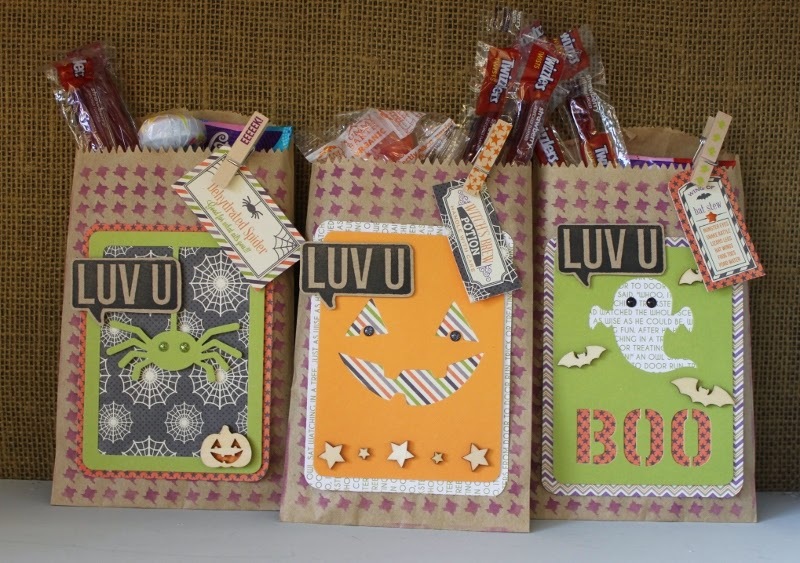 One of the best parts is the candy, so I love to make fun Halloween treat bags for my family. This Vintologie stamp and stencil set combined with the new Jillibean Soup Owloween papers and Halloween mini placemats were just what my little monsters needed.